Amazon Quickight's business analytics enables organizations to scale to hundreds of thousands of users and delivers responsive performance by using a robust in-memory engine (SPICE). 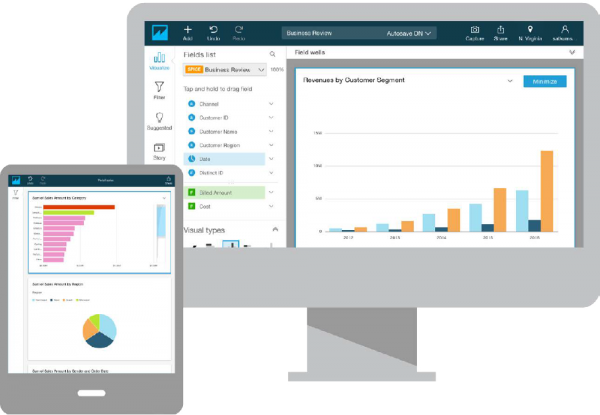 Amazon QuickSight is a business analytics service you can use to build visualizations, perform ad hoc analysis, and get business insights from your data. It can automatically discover AWS data sources and also works with your data sources. Companies often rely on writing complex ad-hoc SQL queries or manually sending static spreadsheets to share data and insights. QuickSight’s pay-per-session pricing and serverless architecture enable you to deliver insights to everyone in your organization. With QuickSight, you can share rich and interactive dashboards with all your users, allowing them to drill down and explore the data to answer their questions and gain relevant insights. Users need reports, visualizations, and insights quickly, so they can act immediately when unusual business events occur. With QuickSight you can automatically generate and schedule reports that are delivered to your inbox on a schedule you set. This allows you to drill into the underlying data for further exploration and to identify any business patterns and trends. With QuickSight, you can easily embed interactive visualizations and dashboards in your applications and web portals. When users access those dashboards, you pay based on how much they are actually used. Create and publish dashboards in QuickSight and then embed those dashboards in your applications with single sign-on and APIs using the AWS and QuickSight SDKs. Make changes to your live dashboards in minutes, without writing code and without a cumbersome deployment process.